William Wemyss of Wemyss Malts Ltd, Edinburgh, Scotland (produced by Thames Distillers Ltd, London, England), UK. The Wemyss family (pronounced “Weems” or “Weemz”) are bastions of Scottish heritage. They have lived in Wemyss Castle, which sits upon a small cliffside on the Firth of Forth (across the bay from Edinburgh), for over 600-years. The Gaelic origin of their name refers to the castles location on a rocky outcrop and translates as “Caves”. Interestingly, back in the early 1800’s John Haig (founder of the well-known Haig’s Whiskey) built his first Distillery on land leased from the Wemyss family. Currently owning vineyards in France and Australia, the family decided to establish Wemyss Malts Ltd in 2005. Their aim is to build a Whiskey portfolio of distinction, which they have seemingly achieved, given the many industry awards already attained. In 2013 they announced the building of Kingsbarns Distillery, a new single Malt facility and visitor centre in East Fife (near the famous St. Andrews Golf Course), with a view for completion in 2014. 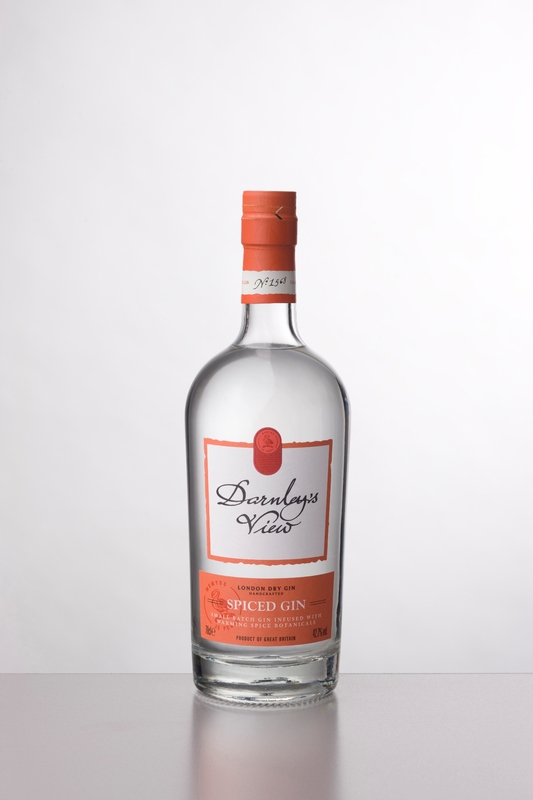 In the late spring of 2010 they launched Darnley’s View, their first Gin, which came to the USA (initially New York and New Jersey) in mid 2011. This Spiced Gin was launched in mid 2012 and we expect it to join its sister in the USA soon. Distilled four times from neutral grain spirit before being distilled with the botanicals a fifth time using a pot still. Same as the first Gin it is presented in a tall clear cylindrical bottle, which tapers up from the bottom to leave broad rounded shoulders. The large white label has black colored writing with an orange colored trim plus a rectangular block of the same color at the bottom. It has a red logo at the top, front and center just like the original Gin. $$$$. Not available in the USA at present but we expect it will arrive soon. Meanwhile, try Master of Malt in the UK but add around another 55% for shipping. 10 botanicals are used, including: angelica root (France), cassia bark (Indonesia), cinnamon (Sri Lanka & South East Asia), cloves (Madagascar & Zanzibar), coriander seeds (Morocco), cumin seeds (Eastern Mediterranean & India), ginger root (China), grains of paradise (West Africa), juniper berries (Southern Europe) and nutmeg (Indonesia). According to history on 17th February 1565 Mary Queen of Scots was at Wemyys Castle and through a courtyard window saw Lord Darnley, who was to become her future 2nd husband. They married 29th July 1565 and had a son who was to become King James VI of Scotland and later, combining both the thrones of Scotland and England, King James I. From such a seemingly insignificant moment, naming the Gin “Darnley’s View” brings a personal family story into the perspective of great historical significance. This particular spirit is a “spiced” version, building upon the release of their first Gin. This romantic story should finish with “…and they all lived happily ever after”. Unfortunately Lord Darnley had a drink problem and was violent with it. This led to bouts of paranoia; including the belief his wife was having an affair with her Private Secretary, David Rizzio. In a frenzy of jealousy he violently killed Rizzio in front of his then pregnant wife at their palace, Holyroodhouse, on 9th March 1566. It is thought their relationship all but dissolved following this horrific event and on 10th February 1567, just 2-years after Mary had first met Darnley, Kirk o’Field (the Kings residence, next to Holyroodhouse) was blown up with gunpowder and the strangled bodies of Lord Darnley and one of his servants were found in the garden. There are numerous theories as to the identity of the assassin(s). The most notable suggestion being Mary arranged for the Earl of Bothwell to kill him, perhaps further fuelled by the fact she married Bothwell 3 months later – Bothwell having been tried and acquitted of Darnley’s murder prior to this. This marriage proved unpopular and just 2-months later Mary was forced to abdicate (in favor of her 1-year old son) by the Scottish nobility and fled to England seeking the protection of her Protestant cousin Queen Elizabeth I. Unfortunately she had previously laid claim to the English throne (a bid supported by many English Catholics) and was imprisoned instead. Mary spent over 18 years in English custody before a plot to take the English throne was uncovered and resulted in her execution for treason. Unfortunately the beheading was not a “clean” execution and it took 2 swings with an axe before a saw was used to sever the final sinews to remove the head! On the nose is spice (cinnamon, cumin & nutmeg) with sweet lemon and faint juniper. On the palate this creamy smooth full-bodied spirit has juniper and citrus with warm spicy notes e.g. cinnamon, cloves, ginger and nutmeg. The close continues with this warm spice (coriander & cumin come through more here) and a dry lingering peppery finish (with faint pine juniper in the background). This is a hard balanced Gin to pull off, aspects of the London Dry characteristics teeter on being over powered by the spices! Perfectly fine to sip by itself with a little ice it is however best placed in mixed drinks. This makes a spicy Gin & Tonic and we think ginger ale is perhaps a better choice to match the spice profile – certainly use a lime slice as garnish. There is a similar spicy taste in a Martini and we believe it is perhaps better in a Sweet Martini or even use bitters rather than Vermouth, making a Pink Gin a very good choice. We really like this in a Negroni, think along the lines of mulled wine and you get close to how this tastes. 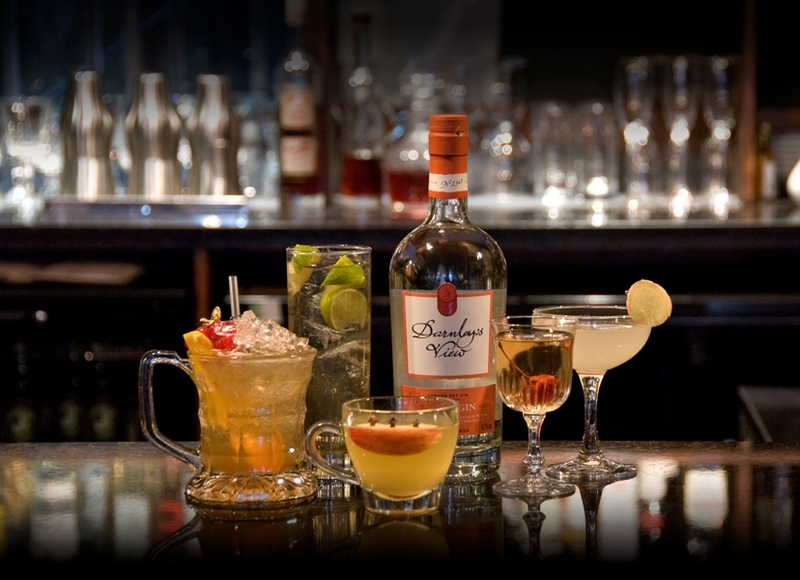 Where the original Darnley’s View excels as a summertime Gin, this spiced version makes for an excellent wintertime one. They are really two different Gins and whilst sharing a similar juniper and citrus foundation they then diverge, going their own separate and equally good ways. This Spiced version is a novel spirit, managing to retain the London Dry profile, while bringing something new to the world of Gin. Traditionalists will either love it or loathe it, we suggest accepting this is a Spiced Gin (forget it’s a London Dry) and embrace its warm spice qualities to your heart. Wemyss and Thames Distillers have done themselves proud, and we applaud this welcome addition to the world of Gin. Bronze Medal, International Spirits Challenge, 2013.